Nowadays, for most of us, there is a shift in the way we are doing sport. Winning is personal. It is not necessarily a matter of competition between each other anymore. Sport is now seen as a way to focus on ourselves - how we could find our own best by reaching personal goals. Sport is also a way to stay active in a world that expects a lot from us. We want to have a well-balanced and a healthier life in order to feel confident in our daily routine. Lucozade would like to play a key role in this modern world of sport and exercise. 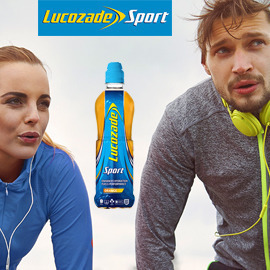 Lucozade Sport drink is designed to enhance hydration and fuel performance during intense sport and exercise. Create a print ad that propels Lucozade Sport into the modern world of sports, where people exercise to reach personal goals and to live a balanced, healthy and active lifestyle. Format: Print ad (photo or illustration with tagline and text explanation. 2 pages in total, PDF only). Send us your entries till June 28, 2015 23:59 UTC!